Here's samples of my automotive illustration, model kit box art, and decal designs from my portfolio. Click here to see other automotive illustration projects I've designed. 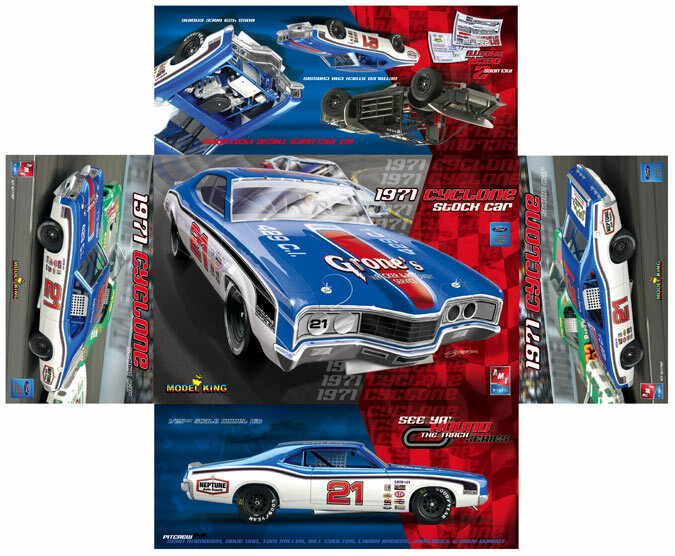 The old MPC '71 Cyclone Stock Car was a highly sought after kit and as an automotive illustrator I was very excited to design a new box and decals for it's re-issue by Model King. 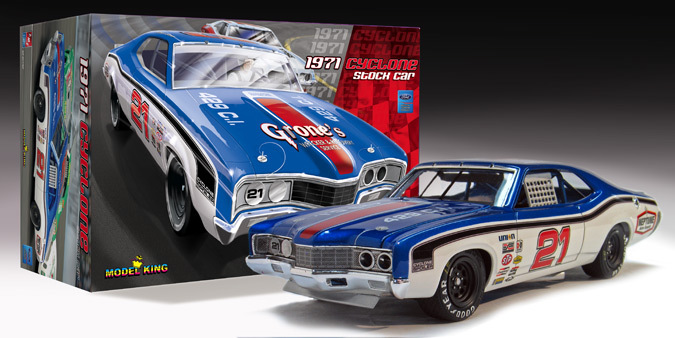 The Cyclone is part of a series of vintage re-issued stock cars that have not been available since the early '70's. 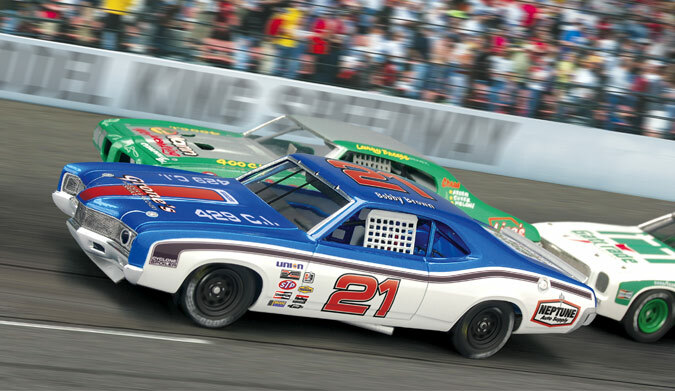 The series also includes a '72 Torino, '75 Laguna and a '72 Monte Carlo. These kits were going to be a series, so I wanted to use a common color palette to give them a family look on the store shelf. Since, NASCAR racing is a uniquely American sport and these were American cars I went with a red white and blue theme for the cars. Because the Cyclone was my favorite of the series and blue is my favorite color, I went with metallic blue as the primary color on this one. The manufacturer provided me with a early test shot and I built this kit "straight from the box" to be used for the package photography. 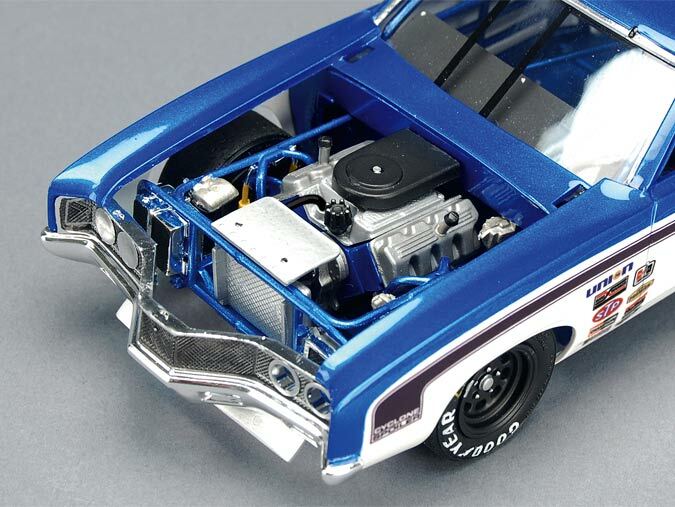 The paint is Tamiya Metallic Blue over their gloss white. The clear coat is PPG concept 2000 urethane. It was decided early on that each kit would get 2 large decal sheets. I would design all the generic decals and fellow modeler Dave Van would design a "scrambled" sheet for each kit. The "scrambled" sheet can be unscrambled to make a replica of several lesser known drivers. This was sort of a way around licensing issues. 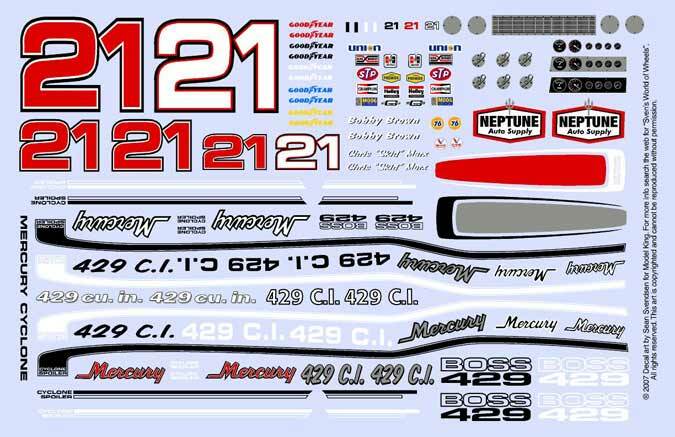 Most people buying this kit will probably purchase aftermarket decals to make a specific car. Generic decals sheets usually get tossed in a pile and forgotten about. I knew this from the start, so I tried to make the ones I designed more useful. I added details like gauge faces, grill work, & other details which I thought could supplement an aftermarket sheet. 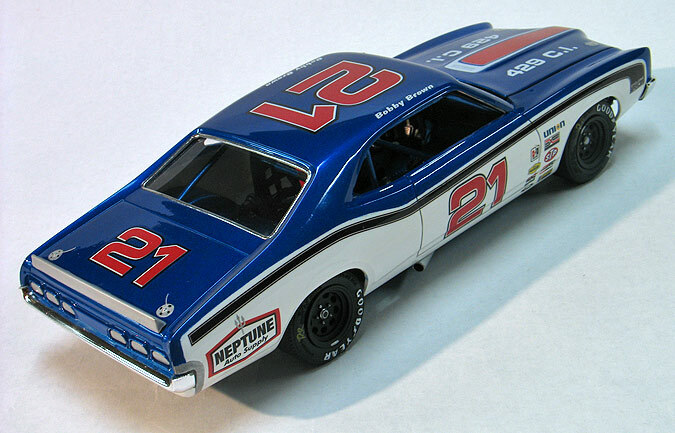 Model King also recently re-issued many of the old AMT 60's dirt track race cars. Since those kits are generic in nature anyways, I designed the rest of these sheets with their generic numbers and sponsors for use on those kits as well as this Cyclone. As a side bit of trivia, the stock "Cyclone Spoiler" striping is on the sheet because I had already done it for a previous project. 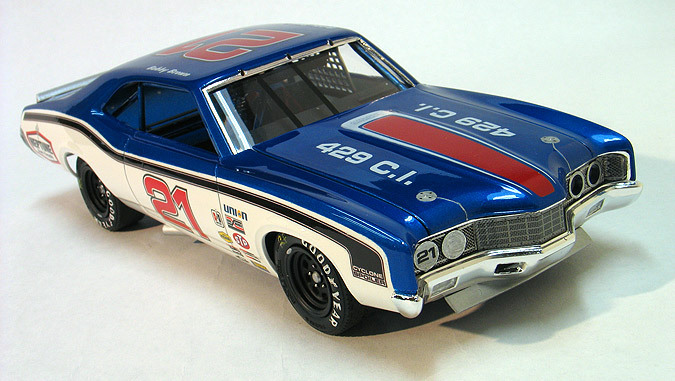 You see, Model King had originally asked to re-issue the stock bodied '71 Cyclone funny car kit, not the NASCAR version. RC2 said they had the tooling and gave the OK. 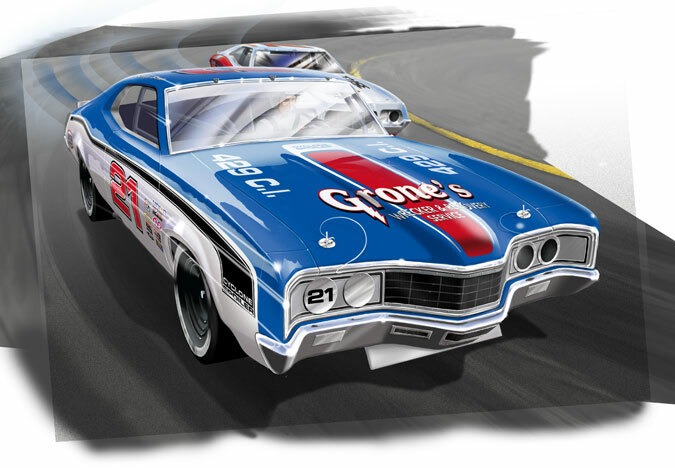 I created a decal sheet for the funny car and was half way through the box art when Model King calls me and tells me to stop! RC2 sent him a test shot and it was not a funny car but the NASCAR version! So, I switched gears and recycled the stripes onto the decal sheet. For the package design I wanted to show the cars in action. For the box tops, I created an illustration of the car on track. For the box ends, I want to again show the cars at speed but this time do it with photography. 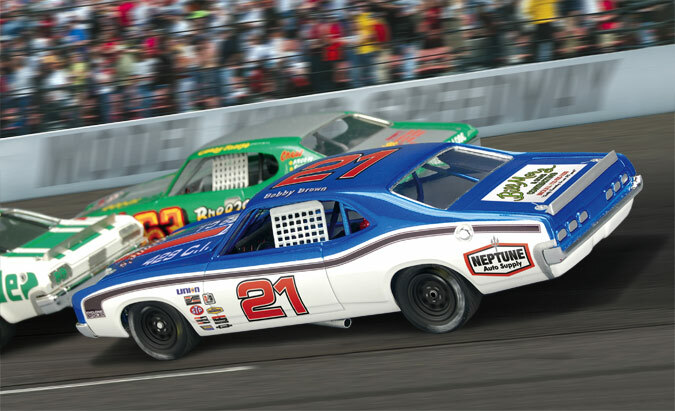 The car was photographed on a white "sweep" and then digitally composited into a race scene using Photoshop CS2. I also carried the red, white and blue theme onto the box design but alternated the colors on the boxes so they would all be a little different. IMPORTANT DECAL TIP: The manufacturer printed them with a very thin clear carrier layer. The good news is that because they are so thin I have found that they will confirm nicely to compound curved surfaces without the use of a setting solution. The bad news is that they can be difficult to handle. Because they are thin, I've found they have a tendency to want to curl in on themselves while you are handling them. To help prevent this, while they are wet, keep the paper backing with the decals and place the decal against the model. Next, carefully slide one edge off and stick it down to the model. Then carefully slide the paper from underneath the decal and work the decal down on the model. Unless you are very familiar with these decals, I would strongly suggest trying some of the art you are not planning to use on a scrap body and practice your technique before committing to the good stuff.